TWO minors from St Mary’s, Chitungwiza, were killed last Friday when a perimeter wall collapsed on them while they were playing outside a neighbour’s house. Kudakwashe (6) and Junior Mutami (8) were playing with two other children when the incident occurred. Junior was a Grade 4 pupil at Shingirai Primary School, while Kudakwashe was in Grade 1 at Zengeza 7 Primary School. The two were buried on Sunday at Nyatsime Cemetery. 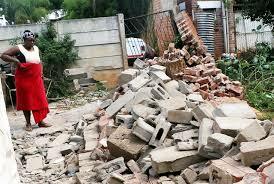 According to a source, the children were fully covered by bricks when the wall collapsed on them. “The two boys had gone to play with two children who stay where the tragedy took place, but we are reliably told the wall had been slanted for years. “Now the other two left and went inside the house to prepare for school and immediately after that, the wall fell over the two brothers who lived about five houses from the scene of the tragedy,” the source said. He said people rushed to assist the children, but they were badly injured. “When the wall fell it fully covered their bodies and those who came to rescue them retrieved the elder brother and were later alerted by a child about the younger brother and that is when they removed the debris and uncovered him, but he was already gasping for breath. “The parents who were not home received a phone call and rushed to the hospital were the kids had been taken to,” he said. Zimbabwe Republic Police Harare provincial spokesperson, Inspector Tarirai Dube confirmed the incident.